During the week, we get a little busy with soccer, dance, work, and every other activity that comes to mind. Even when we are busy, I try to make the most out of meal time. I don’t want to be reliant on fast food places, even if that is what the kids want. I still want to have healthier meal options, rather than using our schedule as an excuse. This is a quick and easy meal that you can set and forget, because it’s made in a crock pot! 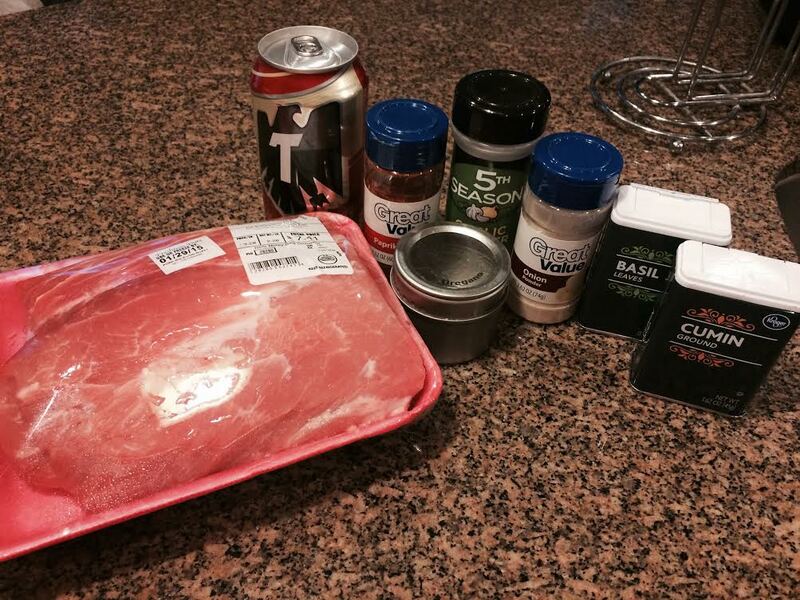 Put the pork in the crockpot, top with seasonings, then pour beer into the crock pot. Cook on low for about 6-8 hours, or high for 3-4 hours. Remove the pork when done and shred. We put the pork in a Tortillaland tortilla (our favorite), along with some cheese. Then I rolled it up, put a little more cheese on top and microwaved for 30 seconds. Once the cheese was melted, I topped this with hot sauce, sour cream, olives, avocado, lettuce, tomato, and radishes. It was like a salad on top of my burrito and it was great! What are some of your go to meals when you are super busy but don’t want to eat out? Eating out can be expensive, so having healthier meal options at home is a great way to save money and also know exactly what is going into your food. It’s hard wanting your kids to be active, but then following up a meal with fried chicken or $1 burgers. I love to meal plan because this makes it easier for me to plan ahead and be prepared for those super busy days! Quick & Easy Meal Time – Bacon Fried Rice! This meal was such a hit that my 10-year old asked for more!! 🙂 SUCCESS!!! In a medium saucepan, cook rice following package directions. I prefer sushi rice because of how sticky it is. While the rice is cooking, cook bacon in a large frying pan. Once bacon is done, remove from pan and place on a plate with a paper towel to drain. Drain bacon grease from pan, leaving about 1 TBSP in the pan. Add broccoli to frying pan and cook for about 3-5 minutes. Then add 3/4 cup of water. Simmer for about 5-7 minutes until the broccoli is crisp, but tender. Add peas, soy sauce, and soybean oil. Cook until the peas are no longer frozen. 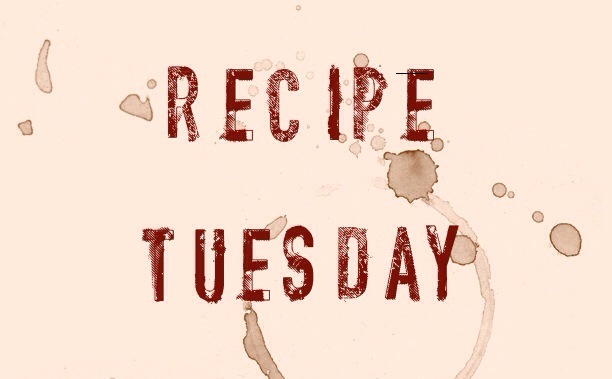 Take bacon and cut into 1/4 – 1/2 inch slices. Add bacon to frying pan and add cooked rice to frying pan. Once the rice, bacon, and vegetables are mixed together, cook the eggs. This was nice because you can make the eggs to everyone’s liking. I cooked mine and my daughters over-hard, then my husband and son had their eggs cooked over-medium. Top with cashews, cilantro, and green onions if you’d like. With winter right around the corner, I figured it’s as good of time as any to post a winter recipe! It’s been a wee-bit crazy around here. I’ll get into that on another post, but this is one of my all time favorite recipes. 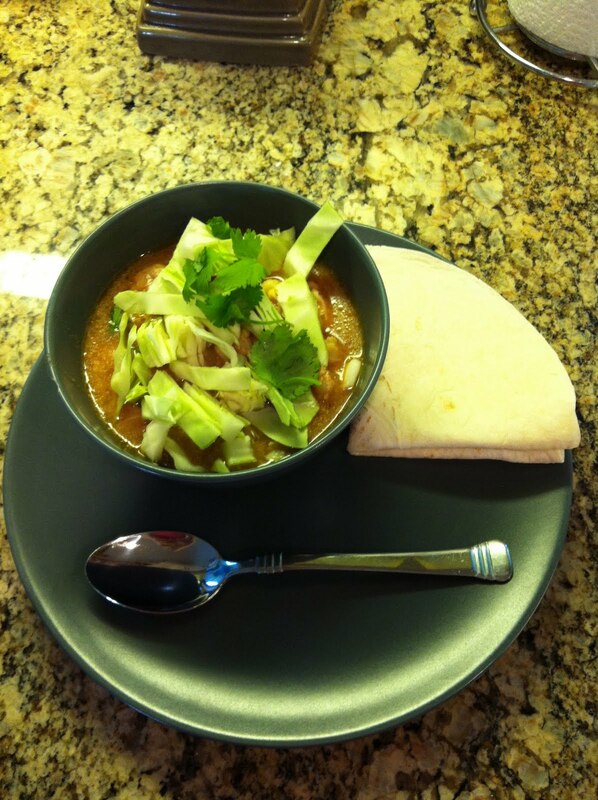 PORK POZOLE! With this recipe, I knew it tasted great. But my family went to a local Mexican restaurant here in Utah called Red Iguana. If you are ever in the Salt Lake area, you MUST go there! It’s delicious. But anyway, my son got the pozole because he loved mine. And guess what???? They taste the exact same. I cannot tell you how excited I was about this! But here is the recipe! I usually double it so I can have leftovers for the next few days. Enjoy! Spray inside of crock pot with non-stick cooking spray. Add hominy, tomatoes with juice, enchilada sauce, onions, garlic, chili powder, cumin and paprika, then stir. Place pork in sauce mixture and stir to ensure all of the pork is covered with sauce. Cook on high for approximately 2-3 hours. With about 15 minutes left, add lime juice and desired amount of cilantro, then stir. Serve in bowls topped with avocado, sliced cabbage, lime wedge and a tortilla. Italian Gumbo – SAY WHAT??? 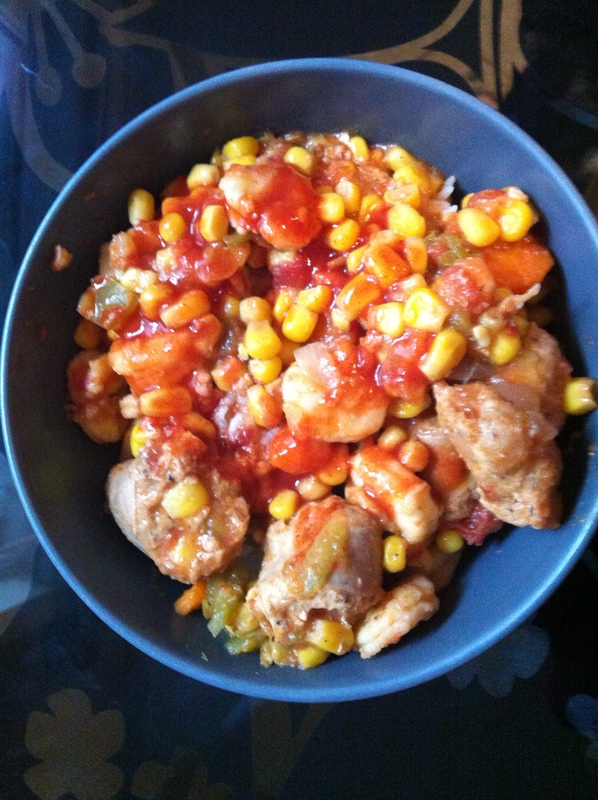 Last night, I made an awesome and VERY easy meal! It was a mix between Fettuccine Alfredo & Gumbo. It was fantastic! Hope you like it! 🙂 And as always I forgot to take a picture! Cook pasta according to the package instructions. While the pasta is cooking, cut up the sausage, onion, and garlic. Put in a large pan and cook until onions are tender. Add in tomatoes, cream, and corn. Cook for about 8-10 minutes. Once pasta is done, drain and add to large pan with the cream sauce. Mix well and cook for a few minutes longer, then serve! Top with chopped parsley to make it extra fancy! This was such a HUGE hit with the family that I had to share with everyone! 🙂 It was easy and SO good! Why oh why don’t I take more pictures of the food I make!!!! I really need to get into the habit. 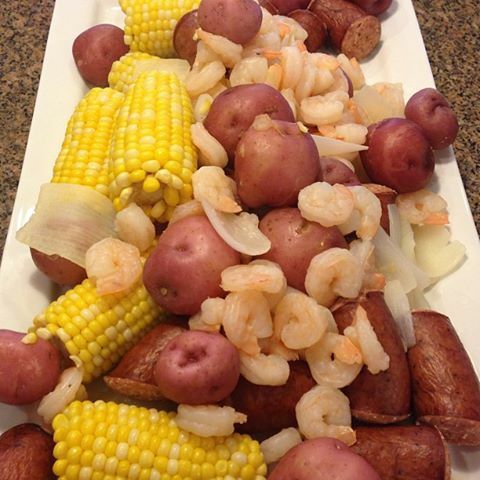 This was a great meal that I made for the family. We served it with a side of rice and fresh broccoli from our Bountiful Basket! I think I’ve cooked 4 meals in a row so far without the kids complaining. This makes me one happy mama! Preheat oven to 325. While the oven is preheating mix together 1/2 tsp each of sage, salt, and black pepper. Place pork loin in a roasting dish and rub spices all over the outside. Cook at 325 for 30 minutes, then increase the heat to 350 for another 30 minutes. When the pork loin has about 15 minutes left, combine pineapple, the juice of 2 oranges, the zest of 1 orange, 1/4 tsp sage, and 1/2 tsp of cinnamon into a sauce pan. Bring to a boil, then lower heat to a simmer until pork has cooked for 1 hour total. At the one hour mark, take the pork out of the oven and pour sauce from the saucepan over the pork. Cook pork for another 30 minutes at 350. Once pork is done in the middle, remove from oven and cover with foil for 15 minutes before serving.